Whew... the Christmas holidays brought a whole lot of sickness with them in BC, and my family has been hit hard with a nasty bug. I've wanted so badly to create something, but had no energy or mojo... I did however manage to force this card out to show you a peek at our January SOTM, a Saturated Canary image from Little Darlings Rubber Stamps! Not fully trusting my colouring skills (or rather the ability to follow through with colouring a whole image LOL) I chose to work with just the snowman part of the stamp! 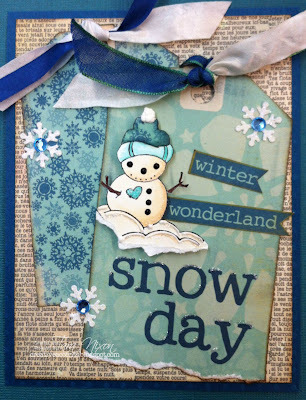 The tags are pre-printed from BoBunny's Snow Day collection and the background paper is from the gorgeous Serenade collection by Basic Grey. She is called Winter's Day and I think she's fabulous for our January weather! You can see the rest of the Saturated Canary images we have in the store (on sale 20% off for SOTM members) here. Hope to be back soon with the finished sample board for ya... but for now, hope you're happy and healthy! p.s. The store will be CLOSED on Saturday, Jan. 5 so we can take another go at rest & trying to get healthy! See you back on Monday! Well, I hope everyone's feeling better by now! What a great idea to just use the snowman part of the stamp! This is such a cute stamp, your SOTM members should have fun with this one! Hugs from Roxy.